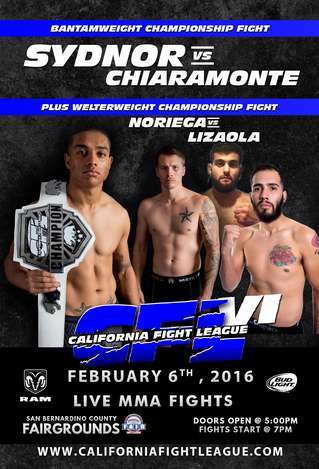 CFL VI, February 6th, 2016 at the San Bernardino County Fair and Event Center. and California State Champion, Jonathon Noriega vs. Adam Lizaola for the CFL Welterweight Championship Title. As well as many other matchups with some of California's top rising MMA stars. Also, every ticket includes a FREE meet and Greet with UFC legend Grey Maynard, and much more! California Fight League is focused on bringing you the best in California MMA. With a team that includes years of both MMA and event industry experience, each CFL event provides professional level production, to match professional level competition. California Fight League, Pure California MMA.